Wracking your brain over writing? Puzzled by punctuation? Groaning over grammar? You need shortcuts. When you're a student, writing an assignment that's due tomorrow, you don't have time to flip through a massive grammar textbook or study a style and usage guide. You need "Shortcuts for the Student Writer", the ultimate all-in-one reference source with fast and easy answers to all your writing questions. Everything you need to know - grammar, style, usage, and punctuation - is here in one quick-reference volume. 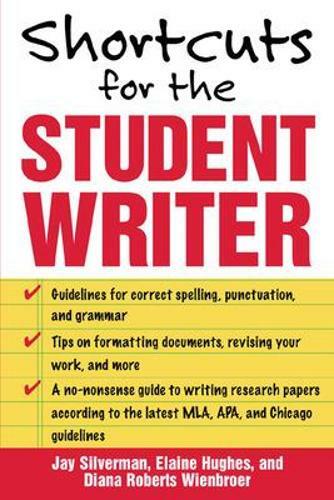 Designed especially for the student writer, this handy guide even includes special sections on researching and writing term papers and essays. It shows you the smartest way to avoid stupid mistakes.You can find quick answers to the most common questions: Its or it's? There, they're, or their? Good or well? Lay or lie? All right or alright? It features the fastest way to check grammar and punctuation. You can learn when to capitalize, abbreviate, or italicize - and how to use periods, commas, colons, semicolons, dashes, quotation marks, and parentheses. It shows you the easiest way to fix faulty sentences. You can discover simple solutions for run-on sentences, tangled sentences, dangling modifiers, shifting tenses, sentence fragments, and other errors.It shows you the best way to organize and research a paper. You can take advantage of the latest tools and technologies to create an effective work that's well written, well developed, and well documented. It also includes an essential index of Internet resources, databases, online news sources, electronic texts, search engines, subject directories, and reference books. Jay Silverman has received national fellowships and an Honors Program Award for Excellence in Teaching at Nassau Community College. Elaine Hughes taught writing for over 25 years - in colleges, business seminars, and creativity workshops. Diana Roberts Wienbroer has taught writing for more than 30 years and served as chair of the English Department of Nassau Community College.